In the 80’s we learned that “Heather Has Two Mommies.” Well, now it’s two 2010, and Dayton and Saunder have two Mommies, a Daddy, 6 mammalian pets (plus a fish tank), – and now a big ‘ol stranger living in the basement. But my guess is that Eric won’t be a stranger for long. The family’s household is bustling with activity. They live outside DC in a Maryland townhouse full of fun stuff to stimulate the senses for children and adults alike: bookcases bursting with books and DVDs, lots of toys neatly organized, Julie’s many interesting collections (old cameras, Superman memorabilia, sock monkeys), tons of folk art on the walls, Sara’s piano in the dining room. 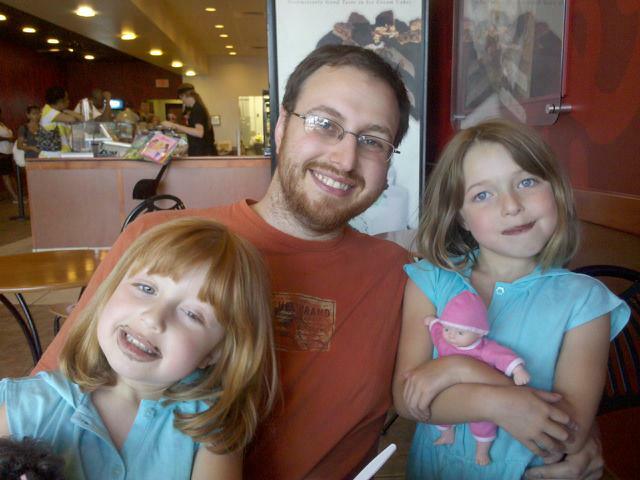 It’s a colorful and dynamic household; you can see that a lot of learning and activity goes on there all the time. 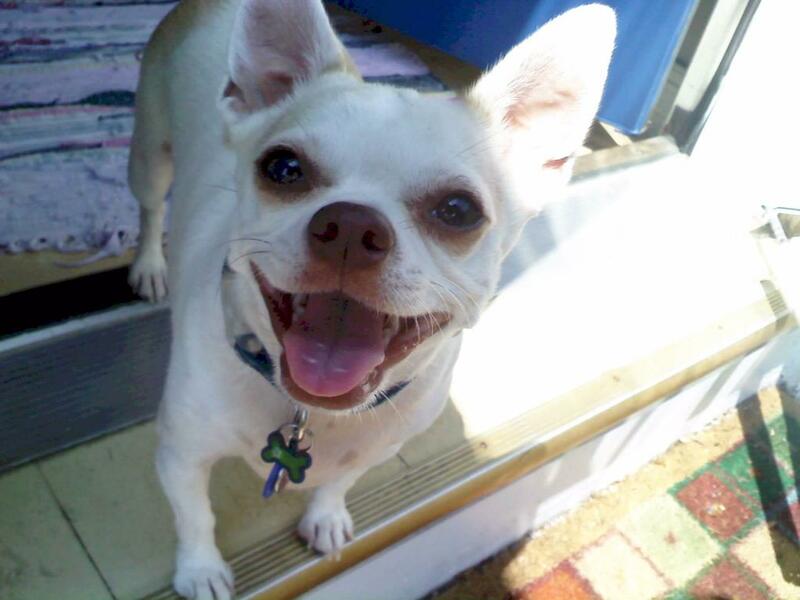 If you visit, you may be welcomed at the door by Luca (above), one of the pet brigade. He talks tough, but really he’s hoping to get to know you well enough so that you’ll scratch his neck. Added to the menagerie is Eric’s cat Lisha, (the fattest cat I’ve seen outside of the cartoon world), bringing the household’s feline population up to 4. If you’re wondering, the cats and Luca have their differences from time to time, but they all love each other and get along fine, just like the rest of the home’s inhabitants. Being a thoughtful and lovely person, Brant had the idea to have a special welcome dinner for Eric, and asked for my help in coordinating it. We decided on a Cajun theme. New Orleans has a special special place in the hearts of this family. 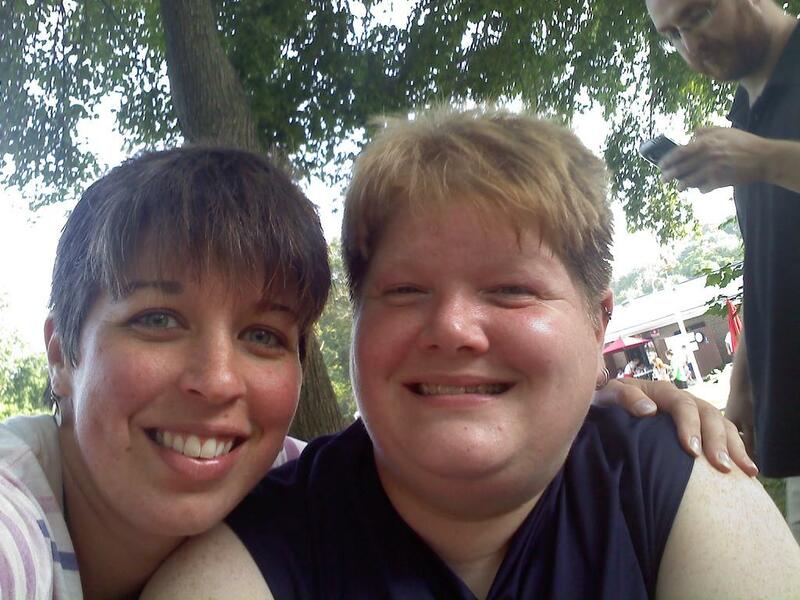 Julie and Sarah (pictured, right) chose New Orleans as the destination for their first vacation together. They also had a New Orleans theme at their wedding, complete with a zydeco band and Cajun menu. Brant has also taken several trips to New Orleans in his previous job as a conference planner, so he knows the city and the cuisine quite well. 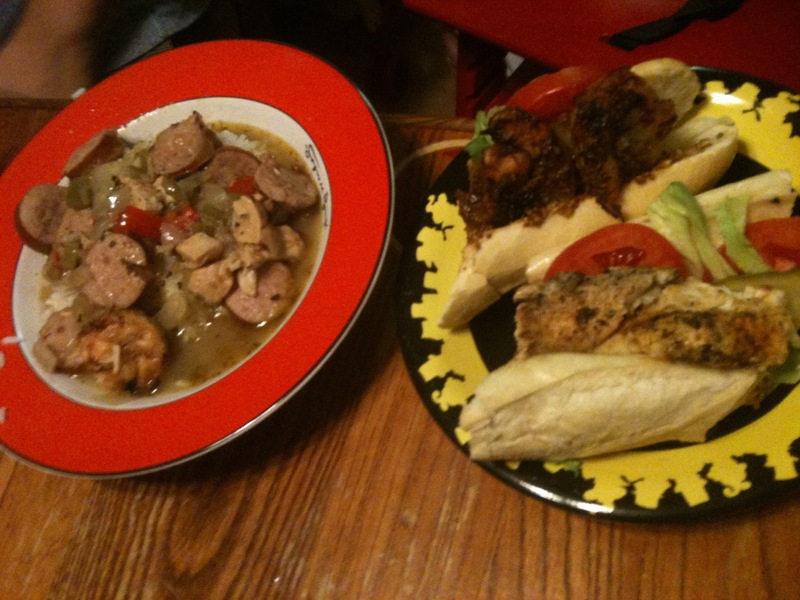 Our menu came together quickly: Po’ boys and gumbo. The gumbo would start with a roux and be flavored with Cajun cooking’s “holy trinity:” bell pepper, celery, and onion. Chicken and smoked sausage would be the stars of the show. Mix all ingredients in a jar. Let the mustard sit at room temperature for a half hour for the flavors to blend. If the mustard is to thin, add more grainy mustard, a spoonful at a time, to desired consistency (we used one additional spoonful to get it just right). Taste for seasoning and adjust, adding more Tabasco, molasses, or vinegar to taste. Refrigerate any leftovers. Because home is wherever you are. And according to Molly, the teacher in Leslea Newman’s groundbreaking 1989 book “Heather Has Two Mommies:” “The most important thing about a family is that all the people in it love each other.” And when you’re setting up a table to welcome someone into that family, you don’t need a whole lot of fancy stuff. A big pot of gumbo will go a long way. For the Welcome Table should be a table of plenty: Plenty of parents and plenty of kids. There’s plenty of music on the playlist. Plenty of pets are around- if not at the table, certainly nearby. 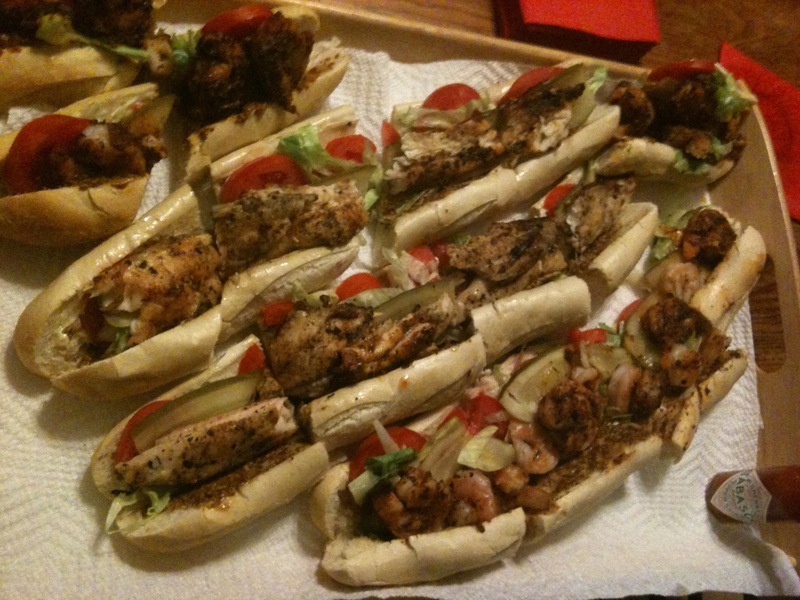 You’ll find plenty of po’boys heaped on a tray, with Tabasco to pass around. Plenty of gumbo is brimming in the soup pot, and there’s plenty of rice. Don’t forget plenty of napkins! You’ll hear plenty of laughter going on late into the evening. And last but not least, there’s plenty of love. So pull up a chair, a stool, a stepladder, a piano bench, or whatever’s around – we’ll always make room for plenty of friends. You may want to stay a while.